I originally published this article about alkaline foods and gout well before I realized the full value of an alkaline diet for gout. Since then, more evidence has been discovered by various gout studies to show that alkaline foods can encourage excretion of uric acid. I have since developed a complete section of my gout diet guidelines to explain the value of an alkalizing gout diet menu. However, this early work is still relevant. So I retained it to explain the value of alkaline foods on uric acid kidney stones, which cause kidney damage to some gout sufferers. Alkaline foods raise more controversy than they are worth. 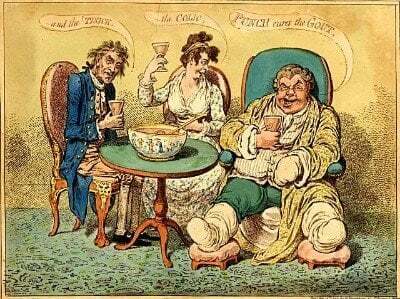 People swear they are the holy grail of health – a magic cure for gout and every other health problem in the world. Skeptics swear back: “You’re wasting your *#@!$&! time. It’s time for us to see the real truth behind alkaline diet and gouty arthritis. Despite my best efforts to explain otherwise, people still believe that you can measure the power of alkaline foods by testing their pH. There are even lists of alkaline foods touted around the Internet that show the pH value for common foods. But these have nothing to do with the alkalizing effect, so why do they exist? They stem from a US government table of pH values produced for the canning industry. Now, physical pH values might help canners and other food packagers. Because they determine what balancing agents they need to avoid food reacting with its container. But these values have absolutely nothing to do with the effect of food on our bodies. The science of alkaline foods recognizes that elements and compounds in food cause different reactions in our body when digested. Some elements, e.g. proteins and phosphorous produce acidic salts. Other elements, e.g. potassium, magnesium, and calcium, produce alkaline salts. These salts end up at our kidneys, where they alter the pH environment. This process has resulted in the Potential Renal Acid Load (PRAL) calculation, which is an approximate estimate of the effect of foods on the acidity/alkalinity of our bodies. Or more specifically, of urine, as this is the measurable result. Still, people remain confused as to how an acidic food item, like lemons or vinegar, can have an alkalizing effect on urine and the kidneys. This happens because the acids in food are very weak acids, e.g. citric acid in lemons and acetic acid in vinegar. The alkalizing components in the fruits do not register on a pH test or our taste buds. Because that changes as we digest the food. When the alkalizing components combine with acid compounds in our bodies. Thus reducing the acid load at the kidneys. In fact, the only reliable way to test the value of alkaline foods is to measure the pH of urine, but beware of the obsession that leads to the second myth. Those who understand the previous myth about the pH of food, easily fall foul of the second myth. Persuaded as they are that alkalizing foods have a positive health benefit, they plan their gout diet solely from alkalizing food lists, avoiding anything that might have an acidifying effect. The compounds that we excrete in urine are a complex mixture of acid and alkaline salts that represent the end product of various aspects of our metabolism. Typical diets commonly produce acid urine. This is increasingly seen as a general health risk, with a specific risk for gout sufferers, as we will soon see. But it is wrong to dismiss all acid foods as bad, and all alkaline foods as good. In fact, we need to balance acid and alkaline producing foods to ensure we get a sufficient range of nutrients, with the overall balance being alkaline. Uric acid is a very weak acid and causes no discomfort as a liquid component of blood. However, as it’s concentration increases, it will form crystals. These crystals are attacked by the immune system, in a similar way to the attack on viruses and other foreign matter that enters our bodies. The alkalizing effect of food has little or no influence on this process. Though uric acid crystals are more soluble in alkaline conditions, an alkaline diet does not change the pH of blood, or at least not in any significant way. The specific benefit of alkaline food for gouty arthritis sufferers is that alkalizing urine significantly reduces the risk of uric acid stones forming in the kidneys, bladder and associated tubes. 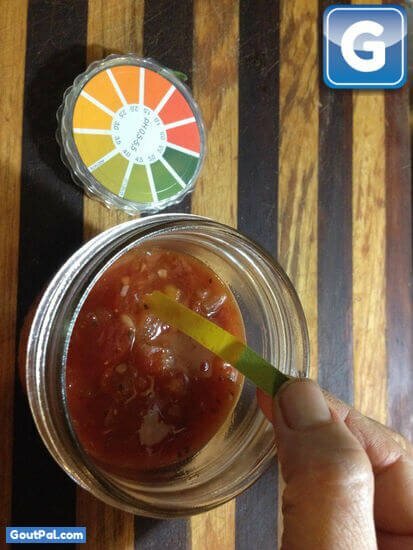 How do you measure your Alkaline Gout Diet? We now have evidence to suggest that alkalizing urine also promotes uric acid excretion, though there is still much work required to explain how this works. I include details of current relevant gout studies in my Gout Diet Menu Guidelines, which I will update with relevant research as it becomes available. In those guidelines, I also include lots of advice and alkaline food tables to help you improve your gout diet. Leave Alkaline Foods: More Myths Exposed to browse my Gout Diet Menu Guidelines.